Powers/Abilities: The General is a Deathlok: A sentient program housed inside a cybernetically reanimated human brain operating a bionic frame augmenting the tissues of that same human's organic remains. It likely had many, if not all, of Deathlok L17's abilities, but we never saw him in action. 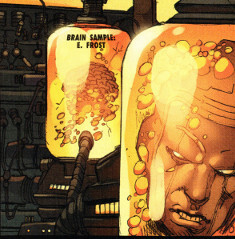 In addition to controlling a para-military force and having access to advanced surveilance equipment, the General also possessed the brain of Emma Frost, which allowed him to transmit information telepathically, and the head of a Kang, which allowed him to transmit such thoughts across time. Weight: Unrevealed (approximately 600 lbs. ; possibly lighter via construction from futuristic materials); (original human form) approximately 230 lbs. History: The General's history is apparently similar, if not virtually identical, to that of Deathlok-10511, at least up to the conclusion of Wolverine: Weapon X#15 (see comments). (Wolverine: Weapon X#12 (fb) - BTS) - At some point, the General became leader of a group opposing Roxxon and its Deathloks/Peaceloks. (Wolverine: Weapon X#12 - BTS) <Perhaps 25 years in the future of Reality-10511> - Learning of high energy readings at the north side of a Roxxon facility, Commander Miranda Bayer appreciated that they were trying to send a group of Deathloks into the past, and she ordered her team to be gathered. When she instructed that somebody should tell the General, one of her men told her that the General already knew presumably the General was sending the man a message telepathically) and wished them luck. Miranda was surprised the General was not coming with them, and the man told her that he couldn't, not to that time and place. 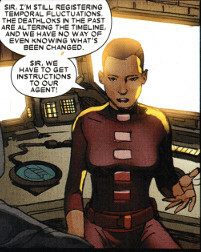 Secretly working with the General, Logan (formerly Wolverine, now lacking both of his hands) accompanied Bayer and her agents on the mission, and superceded her instructions to head in first. (Wolverine: Weapon X#12) - In shadows, the General observed in silence as the Deathloks slew Logan, consuming his flesh with acid, while Miranda led her agents to Roxxon's time machine. (Wolverine: Weapon X#13 - BTS) - Dr. Heimerdinger -- apparent creator of the Deathlok technology in Reality-10511 -- perished. (Wolverine: Weapon X#14) - One of the General's aides reported that they had identified the human hosts on the Deathloks sent into the past, and that they could transfer their agent into the past (Miranda Bayer), and that she could target their civilian identities. She further noted that since this would involve assassinating children that the General would have to give the order himself. Instead, the General continued watching in silence. After Reality-616's Evan Wakowski perished in the modern era, the relative future's Wakowski-10511 vanished, leaving Mirander Bayer's group overwhelmed. The General's aide advised him that the Deathloks were altering the past, and they could not tell what had been changed. 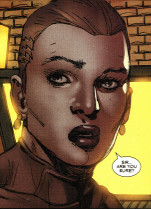 As she urged him to get instructions to their agent (Miranda Bayer-616), the General authorized the brain of Emma Frost to send information back to Amanda-616 via the head of Kang. This led Bayer-616 to seek out the young child who would become the head Deathlok (L17). When that Deathlok confronted her, she threatened to kill him if Deathlok didn't stand down. (Wolverine: Weapon X#15 - BTS) - Wolverine-616 suspected that Miranda's visions had brought her to the child not to kill him, but so she could save him. (Wolverine: Weapon X#15) - The General watched as Miranda-11051 allowed Deathlok (L17) to slay her so he could appreciate the nature of self-sacrifice. His aide reminded him that their team was still out there and needed them...that there was still a chance; but he just stood in silence. (Wolverine: Weapon X#15 - BTS) - In the present, Deathlok (L17)'s computer took command of his form, helped destroy the other Deathloks, and took on a more heroic role. (Wolverine: Weapon X#15) - The General's aide told him their whole team had died and that they had failed to stop the Deathloks from time-traveling. She further asked him what instructions they should relay to their agent in the past, and he told her to tell Miranda that she could not keep the child (who would become Deathlok) and should take him to Danmar Orphanage in Wayland, Massachusetts: There the child would be beaten and neglected and would grow up a remorseless murderer. Still holding the rabbit's foot he had carried when he first evolved into a more benevolent being, the General assured his aide that this was necessary. Comments: Created by Jason Aaron and Ron Garney. The General's past was very similar to that of Deathlok-10511, at least up to the point of the end of Wolverine: Weapon X#15, but that doesn't mean that the Deathlok L17 that traveled back from Reality-10511 is going to become the General. For that matter, we don't know for sure that the General originated in Reality-10511...he grew up in A reality, became Deathlok, traveled into the past, and then ended up in Reality-10511 around the time his counterpart came into existence. Did he travel into the past, have his computer-self take over his human self, and then exist in that time until it progressed to the future 20-some years after he had traveled to the past...or did he travel forward in time an unrevealed period of time following the events paralleling Wolverine: Weapon X? Is the General 20-some years older than the Deathlok from Wolverine: Weapon X, or less (or more)? It's kind of like Kang...many Kang's originate from Reality-6311, but once they travel to a different time/reality, they have events in those times and realities that diverge them from each other...but they still originated in Reality-6311. 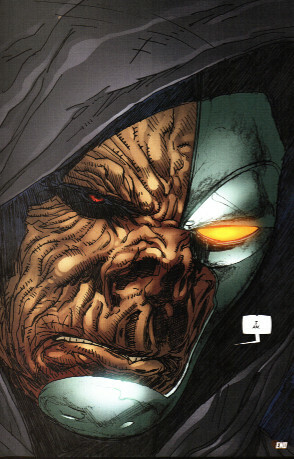 It's pretty clear from the glowing eye that the General was at least A Deathlok, but it is not until we see the rabbit's foot and then his face on the last panel that it is confirmed that the General was a future incarnation of Deathlok L17, manipulating events to ensure his younger selves lived through the same events he did. ...and I'm not sure if the Deathlok in Reality-13021 -- who was used by Stryfe (Hope Summers) and Blaquesmith to predict how altering past events might affect their future (Cable and X-Force#13) -- was that future's Deathlok, or whether they had brought forward the Deathlok from Reality-616's modern era; I personally think the former. She awaited his responses before acting. She was prepared to send his instructions telepathically via the brain of Emma Frost, as well as into the past as needed via the head of Kang. Though she clearly wished to help their agents and she perceived the travel of the Deathloks into the past as a failure, she nonetheless gave no instructions to anyone in the past or present without the General's direct instructions. Obtained under unspecified circumstances, these were in the possession of the General, who used them to communicate. The brain of the mutant telepath Emma Frost, apparently kept alive in a preservative fluid, allowed the General to pass his instructions telepathically to his agents. The head of the time traveler Kang the Conqueror, also apparently kept alive in a preservative fluid, allowed the General to transmit thoughts even across time (or, at least, into the past).